[NaturalNews] A study presented at the Days of Defense Against Environmental Hazards in Russia has unveiled once again the implicit dangers associated with the consumption of genetically-modified organisms (GMOs). According to Voice of Russia, scientists from the National Association for Gene Security and the Institute of Ecological and Evolutional Problems discovered that animals fed GMOs as part of their normal diet eventually develop the inability to reproduce. A shocking revelation; the study is one of several that has identified a link between GMO consumption and infertility in recent years. And because it was conducted independently of the biotechnology industry, it came to far different conclusions than have most of the studies offered up for mainstream consumption in defense of GMOs. Using hamsters as the test subjects, scientists observed that consumption of GM soybeans, which have never been a part of these creatures’ normal diets, tended to slow sexual maturity and gradually eliminate the ability to reproduce. After several generations, hamsters consuming the “Frankensoy” eventually lost their innate ability to reproduce. Dr. Surov and his team then monitored the various groups of cubs, including their rates of growth and birthing frequencies, and compared their findings to the cubs’ diets. After several generations of cubs breeding with each other, the team observed that those cubs who ate GMOs as part of their diet eventually became completely sterile. Will widespread GMO consumption make future generations of humans infertile? Farmers across the U.S. have also reported infertility among pigs and cows that consume GM feed. And in India, an investigatory team observed infertility and other serious problems among buffalo that were consuming GM cottonseed. [NaturalNews] Monsanto, the most evil corporation in the world (http://www.naturalnews.com/030967_Monsanto_evil.html), is the subject of yet another lawsuit in which plaintiffs claim the agri-giant lied to them and ripped them off. Courthouse News Service (CNS) reports that Monsanto recently recruited several agricultural workers in Texas with promises of high pay and free housing, but instead tricked them into working for pittance, and living in substandard housing equivalent to that found in third-world countries. The workers were also told that if they agreed to weed the fields in addition to removing the pollen-producing flowers from the tops of corn plants, they would receive an additional cash bonus. According to the lawsuit, Milo Inc. President Hermilo Cantu Jr., working on behalf of Monsanto, basically promised Cardenas and the others the world, which convinced them to agree to the promised terms and relocate to Indiana. But when Cardenas and the other plaintiffs arrived in Indiana, the “free housing” they were promised turned out to be a run-down motel that “did not comply with substantive federal and state safety and health standards applicable to agricultural labor housing.” The “kitchens” also turned out to be an old school bus that had been outfitted with makeshift stoves and a few refrigerators. The school bus did not have proper lighting or ventilation, and it did not have enough tables and chairs to accommodate all the workers, alleges the lawsuit. 1. Corn: This is a no-brainer. If you’ve watched any food documentary, you know corn is highly modified. “As many as half of all U.S. farms growing corn for Monsanto are using genetically modified corn,” and much of it is intended for human consumption. Monsanto’s GMO corn has been tied to numerous health issues, including weight gain and organ disruption. 3. Sugar: According to NaturalNews, genetically-modified sugar beets were introduced to the U.S. market in 2009. Like others, they’ve been modified by Monsanto to resist herbicides. Monsanto has even had USDA and court-related issues with the planting of it’s sugarbeets, being ordered to remove seeds from the soil due to illegal approval. 4. Aspartame: Aspartame is a toxic additive used in numerous food products, and should be avoided for numerous reasons, including the fact that it is created with genetically modified bacteria. 5. Papayas: This one may come as a surprise to all of you tropical-fruit lovers. GMO papayas have been grown in Hawaii for consumption since 1999. Though they can’t be sold to countries in the European Union, they are welcome with open arms in the U.S. and Canada. 6. Canola: One of the most chemically altered foods in the U.S. diet, canola oil is obtained from rapeseed through a series of chemical actions. 7. Cotton: Found in cotton oil, cotton originating in India and China in particular has serious risks. 8. Dairy: Your dairy products contain growth hormones, with as many as one-fifth of all dairy cows in America are pumped with these hormones. In fact, Monasnto’s health-hazardous rBGH has been banned in 27 countries, but is still in most US cows. If you must drink milk, buy organic. 9. and 10. Zucchini and Yellow Squash: Closely related, these two squash varieties are modified to resist viruses. The dangers of some of these foods are well-known. The Bt toxin being used in GMO corn, for example, was recently detected in the blood of pregnant women and their babies. But perhaps more frightening are the risks that are still unknown. With little regulation and safety tests performed by the companies doing the genetic modifications themselves, we have no way of knowing for certain what risks these lab-created foods pose to us outside of what we already know. The best advice: steer clear of them altogether. For the eighth year in a row, the Environmental Watch Group (EWG) has published an updated ‘shopper’s guide’ based on a comprehensive analysis of government pesticide testing data of 45 different fruit and vegetables. 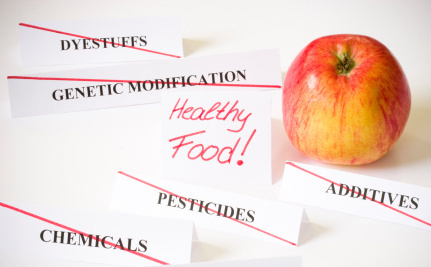 The guide includes the ‘dirty dozen:’ the twelve foods most commonly contaminated with pesticides, as well as the ‘clean fifteen:’ the fifteen least contaminated foods. This year the dirty dozen also includes a ‘plus’ category, warning about two foods containing particularly concerning organophospates, insecticides that are known reproductive and neurotoxins. The use of organophosphates have been significantly reduced in the past decade, but is yet to be banned, and this year, a number of crops still tested positive. The journal Environmental Health Perspectives contains 25 articles published in the past week analyzing and discussing the dangers or organophosphates in our food supply. Also new this year, researchers investigated the pesticide content of 190 samples of baby food, with rather alarming results. As the EWG simply and frankly reminds us, ‘Pesticides are toxic by design. They are created expressly to kill living organisms — insects, plants, and fungi that are considered “pests.” Many pesticides pose health dangers to people. These risks have been established by independent research scientists and physicians across the world.” The U.S. and international government agencies have linked pesticides to health problems spanning brain and nervous system toxicity, cancer, hormonal disruption and skin, eye and lung irritation. However, the Environmental Protection Agency (EPA), under pressure from The American Crop Protection Association, largely representative of the pesticide industry, has failed to apply adequate protective measures in regulating our food supply. One might well ask whether it is wiser to protect a country’s crops or its population. Going into a little more detail for the dirty dozen, 100 percent of imported nectarines tested positive for pesticides, as well as 98% of apples and 96% of plums. Grapes had 15 pesticides in a single sample, while blueberries and strawberries each had 13. As an entire category, grape samples contained 64 different pesticides; bell peppers had 88 different residues, cucumbers 81 and lettuce 78. Highlights of the clean fifteen include pineapples, in which fewer than 10% of samples contained pesticides, mangoes and kiwis, both of which were completely free of pesticides more than 75% of the time, and watermelon and domestic cantaloupe over 60% of the time. Among vegetables, no samples of sweet corn and onions had more than one pesticide and more than 90% of cabbage, asparagus, sweet peas, eggplant and sweet potato samples contained no more than one pesticide. One additional concern to consider: sweet corn, although it may contain less pesticide residues, is quite commonly genetically modified in the U.S. While genetically modified organisms (GMO) are banned or significantly restricted in Australia, Japan and throughout the European Union, the industry is still at large in the U.S., and no labeling is required by the federal government. For this reason, it is recommended that sweet corn consumption also be limited to organic. Among baby food, green beans and pears were especially disturbing: almost 10% of green beans contained the organophosphate methamidiphos in amounts that could easily increase risk for brain and nervous system damage in infants consuming a four-ounce serving of green beans on a regular basis. 92% of pear samples tested positive for at least one pesticide and over a quarter of samples contained five or more, including iprodione, categorized by the EPA as a probable human carcinogen, and not registered for use on pears. In fact, the presence of iprodione in pears of any kind constitutes a violation of FDA regulations and the federal Food, Drug, and Cosmetic Act. While there is no question that Americans need to eat more fruits and vegetables, it’s worth taking an extra step to make sure that produce is delivering the nutrition it’s supposed to, and nothing it’s not. Pause for a moment. Want some neurotoxins with that salad? I didn’t think so. As you may or may not know by now, the United States government has allowed genetically modified and engineered organisms to enter the public food supply with no warning. Every day, millions of people unknowingly ingest these GMOs because corporations like Monsanto (and the politicians they’ve bought and paid for) claim it’s unfair to require them to label their products. Multiple scientific studies have linked GMOs to illness, disease, and mutation in plants, animals and humans. These adverse affects have been found to be especially pronounced in pregnant women and children, consequently a demographic that is more apt to eat the low price, processed foods that carry most of the world’s GMO’s. Until such time as the state or federal government decides to finally stand up for the American consumer by passing mandatory GMO labeling laws, the only way to protect yourself from these toxic “foods” is to avoid buying and eating them. FoodConsumer’s Marie Cendejas recently published a list of the top 10 GMO foods that you should avoid at all costs. We’ve pared down the list to five GMOs we think are especially gross or dangerous. These are the foods that are worth the extra time it may take to research origins and the extra money it may cost to buy organic. As always, buying local is ideal, because you can contact the farmer directly to ask what kinds of seeds are used. Did you know tomatoes were the first genetically modified crop to be commercially available in the U.S.? (Probably not since the government didn’t tell us and they aren’t labeled). In 1994, transgenic tomatoes (known as the FlavrSavr) hit the market. They contained a “deactivated” gene that was supposed to prevent the fruit from getting soft as it ripened. It didn’t work as well as biotech companies hoped. Now, experts are praising a new technique whereby two enzymes, (A-Man, B-hex) are suppressed. Unfortunately, there have been reports that some animals have died shortly after consuming GMO tomatoes. Yum. This one is tough, because even foods that you wouldn’t normally associate with corn have ingredients, like sweeteners, that are derived from GMO corn. As Care2′s Jaelithe Judy reports, genetically modified corn and soybeans were developed by Monsanto in the 1990s to be resistant to the synthetic herbicide glyphosate (better known by Monsanto’s trademarked name for the weedkiller, Roundup). Now, more than 70 percent of corn produced in the United States are the genetically modified, herbicide-resistant variety. Fresh corn from Walmart should be especially avoided. In the late 1980′s biotech researchers developed a papaya cultivar that would be resistant to Papaya Ringspot Virus. To do this, certain viral genes encoding capsid proteins were transferred to the papaya genome. Now, GMO papaya make up about 75 percent of the total Hawaiian papaya crop. Rice is considered to be one of the world’s staple crops. In many areas, it has been genetically modified to contain a high amount of vitamin A. More recently, it was discovered that an American company, Ventria Bioscience, has been cultivating rice that’s genetically modified (GM) with genes from the human liver. Although the company claims it’s only producing this rice to help speed pharmacuetical research, it’s growing it in open, outdoor fields. Meaning crops nearby can be unknowingly contaminated. China, which grows and consumes a huge percentage of the global rice supply, recently suspended distribution of genetically modified rice within its commercial food suppliesover growing concern about its safety. Is Fructose As Addictive As Alcohol? Fructose, which literally means “fruit sugar,”* sounds so sweet and innocent. And indeed, when incorporated into the diet in moderate amounts in the form of fruit – always organic and raw, when possible – it’s about as pure and wholesome as as a nutrient can get. Our dietary exposure to fructose, of course, is primarily through either sugar (sucrose), which is a disaccharide comprised of 50% fructose and 50% glucose by weight, or through high-fructose corn syrup (HFCS), which is mostly a 55% fructose and 45% glucose blend of monosaccharides, but goes as high as 90% fructose and 10% glucose in HFCS-90 form. Pasteurized fruit juices are another concentrated source of fructose, but increasingly, even pasteurized fruit juice is being adulterated with additional sugar or HFCS for reasons that have mostly to do with protecting the manufacturer’s bottom line. Because high-fructose corn syrup contains free-form monosaccharides of fructose and glucose, it cannot be considered biologically equivalent to sucrose, which has a glycosidic bond that links the fructose and glucose together, and which slows its break down in the body. The attempt by the HFCS industry to re-label their product as “corn sugar,” which was recently denied by the FDA,[v]belies their anxiety about the differences, and also reveals growing awareness among the public of isolated fructose’s inherently toxic properties. For example, in vitro studies show that fructose damages proteins seven times more rapidily than glucose through a process known as protein fructosylation, which is when a sugar undergoes a Malliard reaction with a protein, which basically results in the caramelization of blood and tissue contents, “gumming up the works.” For example, if you try baking a pastry made with fructose, instead of white sugar, it will brown much more rapidly as a result of this Malliard reactivity. To view the first hand research on 70+ forms of fructose toxicity click the hyperlink. Like many foods consumed en masse, which may have a lesser known dark side (e.g. wheat), our global fixation on fructose may reveal something about it’s hitherto underappreciated addictive properties. Rates of fructose consumption continue to rise nationwide and have been linked to rising rates of obesity, type 2 diabetes, and metabolic syndrome. Because obesity has been equated with addiction, and because of their evolutionary commonalities, we chose to examine the metabolic, hedonic, and societal similarities between fructose and its fermentation byproduct ethanol. Elucidation of fructose metabolism in liver and fructose action in brain demonstrate three parallelisms with ethanol. First, hepatic fructose metabolism is similar to ethanol, as they both serve as substrates for de novo lipogenesis, and in the process both promote hepatic insulin resistance, dyslipidemia, and hepatic steatosis. Second, fructosylation of proteins with resultant superoxide formation can result in hepatic inflammation similar to acetaldehyde, an intermediary metabolite of ethanol. Lastly, by stimulating the “hedonic pathway” of the brain both directly and indirectly, fructose creates habituation, and possibly dependence; also paralleling ethanol. Thus, fructose induces alterations in both hepatic metabolism and central nervous system energy signaling, leading to a “vicious cycle” of excessive consumption and disease consistent with metabolic syndrome. On a societal level, the treatment of fructose as a commodity exhibits market similarities to ethanol. Analogous to ethanol, societal efforts to reduce fructose consumption will likely be necessary to combat the obesity epidemic. While the parallel between fructose and alcohol consumption may seem strange, the intimate connection between what we eat and our psychological health is beginning to gain wider recognition, especially considering new research linking aggression to trans fatty acid consumption, episodes of acute wheat mania, and the widespread presence of opiates in common foods. It may come as a surprise to many, but there is a fructose-opiate infatuation deeply embedded within mammalian biology, which has been the subject of scientific investigation since the late 80’s. A study published in the European Journal of Pharmacology in 1988 found that both glucose and fructose were capable of antagonizing morphine-induced pain killing effects, likely due to the direct opioid effects of these sugars or their metabolic byproducts on the central nervous system. In fact, the researchers found that fructose was more potent than glucose in accomplishing these effects. Could the narcotic properties of fructose, or one of its metabolic byproducts, explain why we would consume such vast quantities of something so inherently harmful to our bodies? As it turns out, not only has fructose’s manifold toxic properties been studied, but researchers have also investigated what natural substances reduce fructose’s adverse effects. 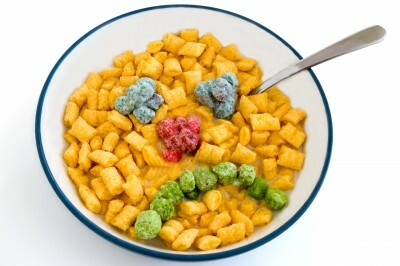 To view them all, you can visit our Fructose-Induced Toxicity page. Ultimately, avoiding fructose in any other than its naturally embedded form in the intelligent and infinitely complex structures of food, e.g. fruit, is ideal. Food cravings for sweets, after all, may conceal unmet emotional or spiritual needs, so sometimes it is best to search deeper within for the answers. Or, using natural non- or low-calorie sweeteners like xylitol or stevia may also take the edge off an intense sweet tooth. But, beyond the increasingly obvious adverse effects of isolated fructose to human health, is the “hidden” damage that fructose does to environmental/planetary health. This is because fructose from HFCS is invariably produced from genetically modified (GM) corn, which requires massive environmental inputs of harmful pesticides, glyphosate, gene products with the ability to transfer horizontally, and other unsustainable practices. The “hidden tax” of fructose consumption is the accelerating, GM-mediated destruction of the biosphere, without which human health and human existence, is not possible — which adds a highly bitter twist to the saccharine sweet story of fructose’s dark side. *Fructose: derived from Latin fructus (“fruit”) + -ose (“sugar”). [i] Fructose: metabolic, hedonic, and societal parallels with ethanol. J Am Diet Assoc. 2010 Sep ;110(9):1307-21. [ii] Antagonism of the morphine-induced locomotor activation of mice by fructose: comparison with other opiates and sugars, and sugar effects on brain morphine. Life Sci. 1991 ;49(10):727-34. [iii] Antagonism of antinociception in mice by glucose and fructose: comparison of subcutaneous and intrathecal morphine. Eur J Pharmacol. 1988 Feb 9 ;146(2-3):337-40.